Select your vehicle information below to find your new tires! Explore the selection of passenger tires for sale at Cecil & Sons Discount Tires. We offer the best prices on several name brand tires like Cooper, BFGoodrich®, and Summit. Choose from tires designed for fuel economy, all-season performance, ride comfort, and more. 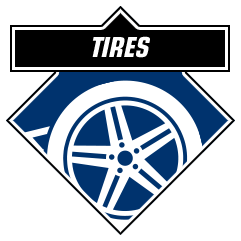 If you need quality tires, wheels or automotive service, then come see the professionals at any Cecil & Sons Discount Tires. Our first retail and repair store opened in Sand Springs at 204 E. Morrow Road in 1973 and 23 years later we opened our second shop at 4002 S. Highway 97. Recently, we opened a new location at 100 South Main in Sapulpa. We proudly serve the communities of Sand Springs, Tulsa, and Sapulpa. Feel free to stop in at any location and see what we’re all about. We're open Monday through Friday 7:30am to 5:30pm and Saturday 7:30am to 3:00pm at all three stores. Contact us online anytime. Cecil & Sons Discount Tires, providing the highest quality since 1973!